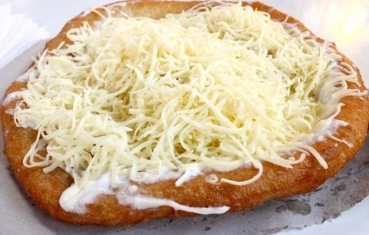 Langos is a deep fried flatbread, common street food eaten fresh and warm in Hungary where it is served with sour cream and grated cheese, rubbed with garlic or doused with garlic flavoured water. Langos is prepared from only few ingredients, flour, yeast, salt, sour cream, milk and egg. 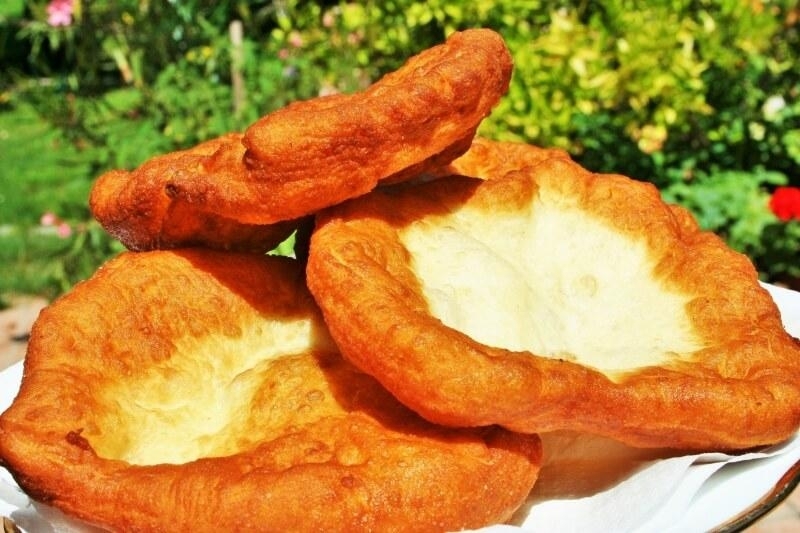 Sometimes boiled mashed potatoes are added to the flour, which is called 'krumplis langos'. Traditionally langos was baked in furnace, or on open fireplace, close to the flames and baked from bread dough, it was served as breakfast on the days when new bread was baked. Nowadays langos is always fried in deep frying oil. 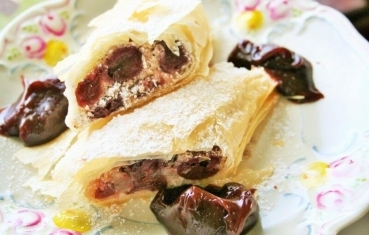 Work with tepid milk and mix all ingredients, slightly knead the dough and put into refrigerator at least for 2 hours. It is important difference compared to other yeast cake doughs where the rising process is kept in warm place but here we put into refrigerator. Once you remove from the bowl make it oil the board insted of floured board. 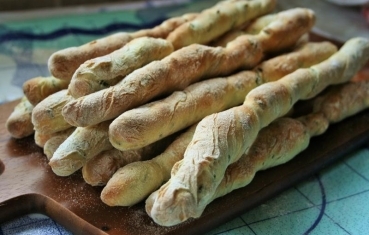 The dough is very soft and easier to work with oiled board and hands. Flatten the dough by your hands and cut equal sized cakes using a glass. You may use smaller and bigger glass depends on how big langos would you like to serve. I like the smaller one because the size available on markets and plage is too filling for instanse to children. If you dont like to fry and eat all the langos at once you can keep the dough in refrigerator for days or in freezer for months. Here I packed with clingfilm and put into freezer. I used to fry at the same time only 4 pieces for breakfast. In this case you have to keep the freezed cakes on room temperature for 10 minutes and ready to fry. Always use the highest temperature oil and don't reduce the heat during the frying. When you put the cakes into hot oil just slightly pull with your fingers. Take care of hot oil because it can burn your fingers, don't throw the dough into the oil, because oil may splash.